The cottages are located on Six Gates vineyard, 1246 Barossa Valley Way, Lyndoch, South Australia 5351. If traveling via Gawler: Drive 12.46km from T-junction of Murray Street and Barossa Valley Highway from Gawler towards Lyndoch and look for the Six Gates sign on the right. If traveling via Lyndoch: Drive 1.7km from the junction of Gilbert Street and Barossa Valley Highway in Lyndoch towards Gawler and look for the Six Gates sign on the left. Once on the property please proceed to your cottage entrance door and contact us on our mobile (0437 376 504) so that we provide you access information. VINES, an exquisite cottage capturing unrestricted views of vineyards & Barossa ranges through extensive picture windows. Decorated with Van Gogh & Monet Canvas art, ornate high ceilings & luxury fixtures, offering one king bedroom with LED TV, ensuite with superb oval spa bath & glass framed shower & double sofa bed for extra guests. This unique cottage is ideal for 2-4 people. LOFT, a grand purpose built cottage on two levels capturing views of the vineyard & Barossa ranges. Ground floor has a king bedroom with decorated high ceiling, LED TV, walk-in robe leading to a stunning ensuite with oval spa bath, double basin & a glass framed shower. The lounge has featured walls decorated with a grand mural of Renoir's Luncheon of the Boating Party. An elegant staircase leads to two bedrooms at the mezzanine level, a two-way access ensuite with spa bath, a designer trough basin & glass framed shower. One bedroom has a queen bed with LED TV & a balcony with breathtaking views. The 3rd bedroom has two single beds convertible to king & views to the gardens. Loft has a double sofa bed in the lounge & can accommodate group of up to 8. RESIDENCE, once a Cobb & Co station, this completely re-developed building displays the elegance of a rich past with 12-foot ceilings, timber floors & leadlights, decorated with fine furnishings in a grand style with Monet art. The bedroom has a luxury ensuite featuring a large oval spa bath for two. Residence has a double sofa bed in the lounge & can accommodate 2-4 people. WILLOWS, a beautiful cottage offering a taste of Barossa history with a glorious vantage point over the surrounding vineyards & the ranges beyond. Once used by coach drivers, this stone cottage has been completely redeveloped to combine the comfort of modern conveniences with heritage characters including pressed metal ceiling, timber floors, fine furnishings & Heysen art. 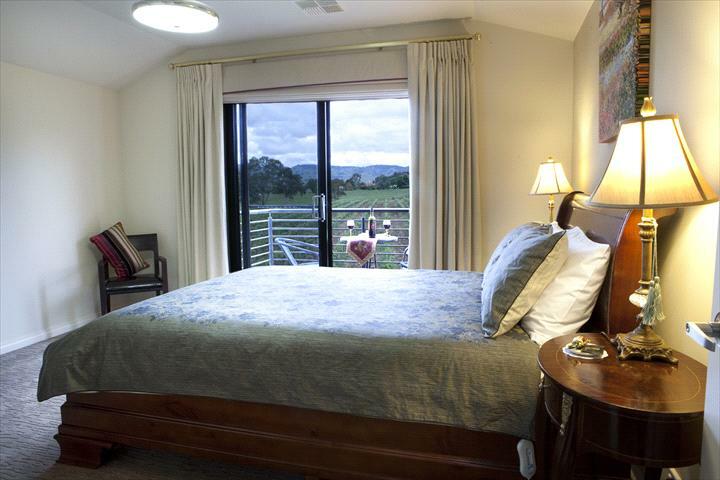 Willows with two queen & one twin bedrooms & two en suites can accommodate group of up to 6. Barossa Shiraz Estate offers five luxury cottages in a beautiful vineyard setting. Enjoy sweeping views over vineyards and Barossa ranges, spa baths, log fire in winter, elegant furnishings and free Wi-Fi access. Cottages are close to wineries and fine restaurants. Our accommodation is deal for romantic getaways or relaxing holiday for couples and groups. Residence: A stunning heritage stone building offering one bedroom with en suite and spa bath, luxury conveniences and amazing views into the expansive garden and vineyard. Willows: A delightful stone building with modern elegance, sweeping views, three bedrooms, two bathrooms one with spa bath. Vines: An architecturally designed building with panoramic views. Vines has one bedroom with en suite and spa bath. Loft: An elegant two-storey modern, purpose built, feature walls, picture windows with breathtaking views. Loft has three bedrooms, two bathrooms with spa baths. The Barn: An exquisite two-storey building with breathtaking views into vineyards and Barossa Ranges, two bedrooms, two bathrooms with spa baths. Enjoy our wines made from grapes at your doorstep, fine breakfast provisions, rural setting yet minutes away from Lyndoch conveniences. Visit wineries close by and dine in a choice of fine restaurants within two kilometres. The Residence state finalist in the 2009 TakeABreak Awards for the Romantic Holiday Accommodation category. RESIDENCE - is a luxury one bedroom vineyard cottage with the elegance of a rich past with 12-foot ceilings, timber floors and leadlights, decorated with fine furnishings and decorations in a grand style. 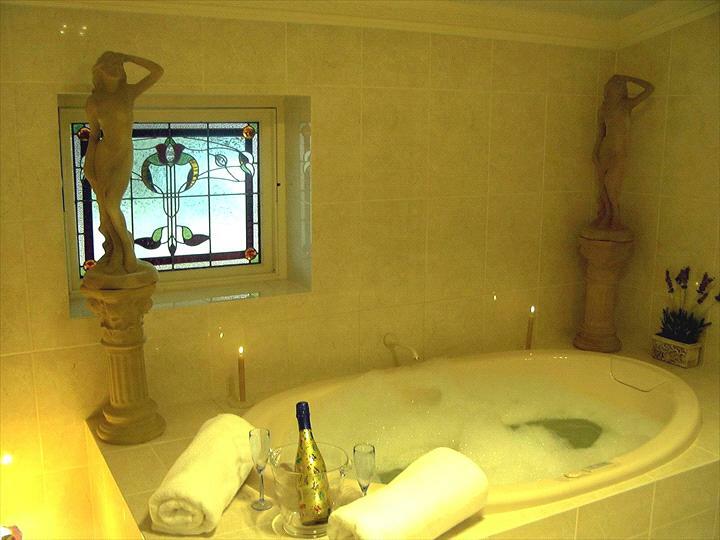 The gorgeous bedroom has a luxury ensuite featuring a large oval spa bath for two. Modern convenience include free WiFi, kitchen facilities, reverse-cycle air conditioning, open fire in winter, LCD TV, DVD and CD players, gas barbeque, outdoor setting and verandah. Guest amenities, hairdryer, iron and ironing board provided. Residence has one bedroom and can accommodate (2 persons). Displayed rates are for one couple using one bedroom (extra charges apply payable to the hotel directly if the couple require other bedding arrangements). Charges applicable to extra guests are: $85 per each extra adult per night. Children 3-12 is $50 per child per night, 0-2 is $25 per child per night. - A decanter of port, chocolates and biscuits on arrival. - Provisions for self-catering cooked breakfast. Wine extra. Stay 2 nights or more and receive a complimentary bottle of estate grown wine. The Barn, once a Royal Mail Coach station, is a unique luxury vineyard accommodation offering exquisite modern design and stunning views. The ground level opens to a scenic verandah covered with the very same cobblestone from the original barn floor. 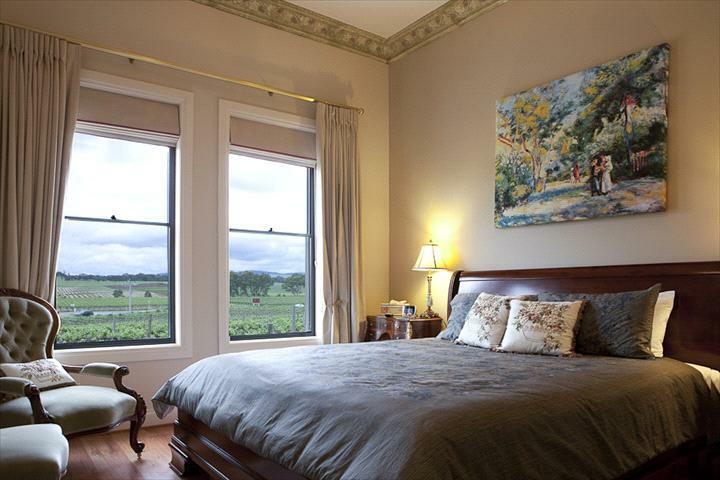 The upper level bedroom suite has wall-to wall windows leading to a stage-like balcony with breathtaking view of the Barossa. �Two king bedrooms on separate floors each with spa en-suite. LOFT - is a stunning self-contained purpose built three bedroom vineyard cottage capturing views of the vineyard and Barossa ranges. The ground floor has a king master bedroom with decorated high ceiling, LED TV, walk-in robe leading to a stunning ensuite with oval spa bath, double basin and a glass framed shower. The lounge has featured ceiling and high walls decorated with a grand mural of Renoirs Luncheon of the Boating Party. An elegant staircase leads to two bedrooms at the mezzanine level, a two-way access elegant ensuite with spa bath, a beautiful trough basin and glass framed shower. One bedroom has a queen bed with LED TV and a balcony with breathtaking views. The third bedroom has two single beds convertible to king and views to the gardens. The cottage has a verandah and private outdoor garden, laundry with combo washer-dryer, LED TVs, reverse-cycle air conditioning, Cheminees Chazelles wood fire in winter, gas barbeque, outdoor setting and verandah. Loft has three bedrooms and can accommodate (2-6 persons). Displayed rates are for one couple using one bedroom (extra charges apply payable to the hotel directly if the couple require other bedding arrangements). Extra charges applicable to extra guests are: $90 per each extra adult per night. Children child per night. - A decanter of port (content only), chocolates & biscuits on arrival. Wine extra. Stay 2 or more nights and receive a complimentary bottle of estate grown wine. VINES - is a picturesque vineyard cottage offering the ultimate luxury. Originally a circa 1890 dairy, the Vines is an exquisite cottage capturing unrestricted views of the vineyards and picturesque Barossa ranges through extensive picture windows. Ornate high ceilings, luxury fixtures, king bedroom with LED TV, ensuite with superb oval spa bath and glass framed shower, double sofa bed for extra guests and a washer-dryer combo make the Vines an unparallel cottage in the Barossa. The cottage has outdoor garden, designer decoration, LED TVs, DVD and CD units, reverse-cycle air conditioning, Cheminees Chazelles wood fire in winter, gas barbeque, outdoor setting, verandah, and is decorated with Van Gogh and Monet canvas art. Vines has one bedroom and can accommodate (2 persons). Displayed rates are for one couple using one bedroom (extra charges apply payable to the hotel directly if the couple require other bedding arrangements). Wine extra. Stay of 2 or more nights and receive a complimentary bottle of estate grown wine. WILLOWS - is a beautiful vineyard cottage with a taste of Barossa history and modern conveniences offering glorious vantage point over the surrounding vineyards, across the Barossa to the ranges beyond. Willows has three bedrooms (two queens and one twin bedroom with two single beds convertible to king). 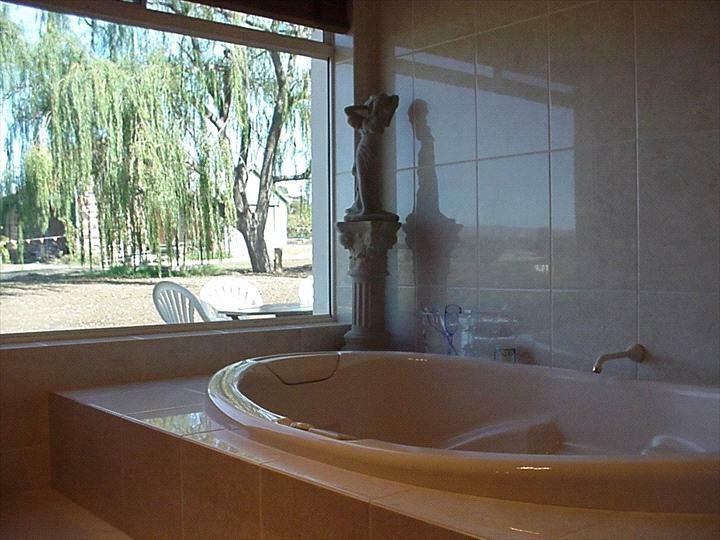 It features two ensuite bathrooms one with stunning spa bath with views into vineyards, one with two-way access. This stunning property has been completely re-developed to combine its characters when used by coach drivers with the comfort of modern conveniences including free WiFi, pressed metal ceilings, timber floors, fine furnishings, reverse-cycle air conditioning, electric blankets, open fire in winter, gas barbeque, outdoor setting, verandah and all the comforts of a cozy home. WILLOWS has three bedrooms and can accommodate (2-6 persons). - A decanter of port(content only), chocolates & biscuits on arrival. Wine extra. Stay 2 or more nights receive a complimentary bottle of estate grown wine. This property does not accept cancellations or changes to the bookings made. Travel insurance is recommended for all bookings to provide adequate protection against cancellation of travel.